Our latest addiction is the crime drama Bones. We found it at Tsutaya and we've been watching it every chance we get. We've made it through the first 2 seasons and are starting season 3 tomorrow. If you haven't seen it, check it out. It's gross, funny and sappy by turns and the ensemble cast is great. 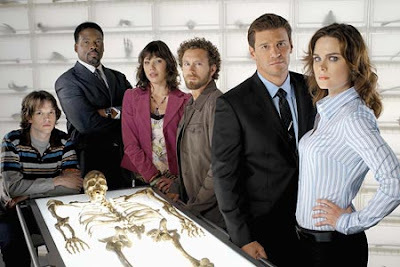 I especially love Dr. Hodgins (third from the right with the curly blond hair).